Nestled in the Ecuadorian highlands, along the Pan-American Highway and about 2,500 metres above sea level, lies Cuenca;Quito’s main competitor for the title of most beautiful city in Ecuador. The historic city centre islisted as a UNESCO World Heritage Site, filled with charming colonial buildings with balconies full of brightly coloured flowers, and the impressive skyline is littered with sleek domes and outstretched steeples. The atmosphere in Cuencais slightly more laid back than that of Quito and is often cited as one of the best places to retire to, but there is a surprisingly active nightlife, albeit not on the same scale as bigger cities. As you might imagine, party hard travellers will get bored of the city quickly, but it is well worth visiting the city to take in the old world charm and explore the arts and crafts scene. There are many galleries and craft workshops tucked away down the city’s various winding cobbled streets, and it is the perfect place to pick up an authentic Panama hat, because why not? This is one of the largest Catholic churches in South America. 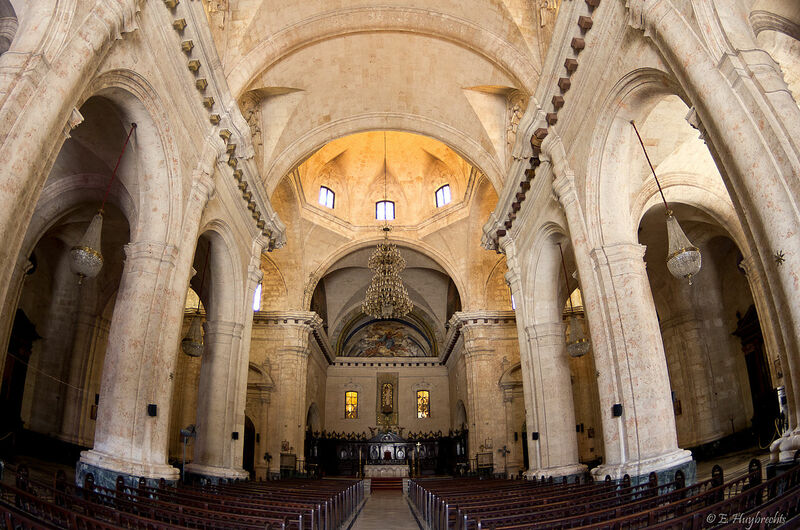 Built in 1885, the cathedral is located at the heart of Cuenca and is famous for its sky blue cupolas and huge golden altar. Visitors willing to facethe high altitude climb can take the stairs to the top of the cathedral for stunning 360˚ panoramic cityscape views.